We are glad to introduce ourselves as one of the leading suppliers of imported Industrial oil and gas burners and its spare parts in the name and style of M/s Aravali Thermal & Environmental Engineers having office at A 1/5 Paschim Vihar N Delhi-110063. We are a ISO 9001: 2008 certified company having works at Rai Distt Sonepat Haryana. Beside dealing and trading in spare parts we manufacture Incinerators, Autoclaves, Shredders, Effluent Treatment Plant, Trommel Screens, Conveyors and Hot Air Generators. We also deal in PLC's , Drives , SCADA system, Electric Switchgears. We also undertake after sale service of above mentioned machinery and equipments. The spare parts namely Fuel pumps, Sequence Controller, Photocell, Transformer, Nozzles , HT Cable are readily available with us at a very reasonable and competitive price at our after sale service division. We deal in imported oil burners like sookook korea, Ecoflame, Bentone, FRB Italy , Unigas. The capacity of the burners starts from 50000 kcal/hr to 10,00,000 kcal/hr. 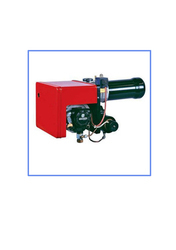 The oil burners are highly efficient and economical.